I wasn’t prepared. In fact I was completely caught off guard. Aren’t they supposed to borrow your shoes before they borrow your bike? I guess if the shoe fits, let them wear it (or in this case ride it), right? 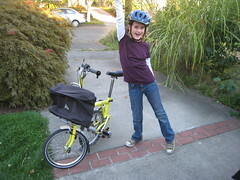 She was thrilled that the new (used) Brompton fit and thought something of mine was actually “so cool.” How many more times will I hear that in the next 5 years? (not many). So I let her ride it before I’d actually ridden it myself and before Tim had a chance to ride his matching yellow clown bike, either. In case you’re wondering, I couldn’t take it out on its maiden voyage because we were headed to pick up her brother at his friend’s house and I needed my Xtracycle to get him home. Originally she was going to ride her own bike – that is, until she saw the tiny yellow one. At least it got some use on the first day. And since it fits her too, another rationalization for a bike I didn’t really need! This entry was posted in bikes, kids, shopping and tagged Brompton, kids, riding with kids. Bookmark the permalink. Wow, great find! It will by mighty easy to carry those on the Xtracycle. A fantastic increase in versatility. My wife bought a folding too, but there is folding and then there is Brompton folding. They really get compact! 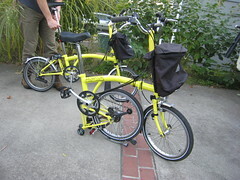 Yes, they are easily carried on the Xtracycle – Tim carried both of them in the hard cases they came in. Without the cases, even easier! That is so cool!! Where do you keep all of your bicycles? How many are you up to now? We’ve got 5 in the basement . Yes, we have a bit of a bike problem. But there are worse problems to have : – ) We have many in our garage and a few in the basement. Tim can now get rid of his beater bus bikes, because he can take the Brompton right on! I have been working my way through your blog and was wondering this same thing. where do you all store those bikes. It has been really interesting reading the past 3 years of your cargo biking. We’ve enjoyed the past 6 years – riding and writing about cargo biking. Glad you are enjoying the archives! We’ve also loved watching cargo biking and family cycling interest explode recently! They’re everywhere now. It sure was lonely at times when we started cargo biking in 2007. Excellent. They look to be 2002-3’s, as sold by Channel Wasson. Original steel front carrier frames… Curious low-rise bars. You’ll need another telescoping post, and some handlebar catch springs, and watch those tires in sharp corners! And those awful saddles… Wide-range gearing upgrades available. For the record, every household needs a longtail, an oma, and a clutch of bromptons. glad to see more families catching on! Damn, Todd. You are good! April of ’02 (so the shorter wheelbase. Not sure what kind of difference that makes) and I have the original paperwork from Channel Wasson in Palo Alto. Amazing eye on the bars — we have the original we’ll install. And Anne fits without the telescoping post, so we’re set there. But we agree on those saddles. The one I’m using is an old vinyl Avocet off my junker bus bike (it was already on a 27.2 post.) It’s actually an upgrade from what came with it — but Frankly, we’re saddle snobs and we NEED more Brooks! It’s one of those deals we couldn’t pass up. We’ve been Brompton hungry ever since we saw you and Dean ride off the plane a year ago, and then well, Julian and Kim sort of ruined it. Seriously, he’s really good at spreading his ABB (addictive bicycle behavior). I know I’m at the edge of fit — I have bar tilted forward for cockpit room, but it messes w/ the fold (the bars won’t reach the catch). Got any tips for making it “bigger”? I wish those conservatives at Brompton would just embrace an adjustable steering column for freaks like me (but then again, I like their backwards compatibility and you can’t have it all). Maybe I just need to do some yoga and embrace the Cancellara TT position. Oh, and you forgot about the tandem in the collection — we still that belongs in the collection. If/when you fit the standard M bars, the forward tilt will have more effect. Ergon grips with little bar-ends will extend further forward. Post-2003 Bromptons have a longer native cockpit. Fit a saddle adapter pin like on Anne’s and the cockpit will grow further. Then a firmer suspension bung to avoid over-activating it with your weight so far rearward. Can also fit a hose clamp around the existing bung to firm it up. Thanks Todd – *my* version of the bike has the stock M-bars. I need to find the happy medium between fold and reach, that’s for sure. And the saddles did both come w/ the pin, though I’m worried about using that and then breaking it (Brompton warns against using it facing backward, right?). I just did the hose clamp (“jubilee clip”) bung (ha! he said bung!) mod, and need to try riding it a bit. I have a few other ideas that I wonder about, plus I’ve heard the green birdy elastomer is another option. The one thing I _can’t_ seem to get used to is those tiny cranks. I run 185mm on my Big Dummy and road bikes (I actually have some 195mm road cranks, but that’s a whole other post). I’ve seen some people refitting 175s. Wonder if 180s work w/ no corner pedaling? And what did you mean about the tires? Are these especially sucky? I’m sure we’ll do Marathons or Kojaks at some point, but I don’t really like the idea of tossing perfectly good rubber. Anyway no need to answer all this here (just the tires, please) — we’ll just have to come down for a visit! Had not noticed the funky bars … but was totally thinking Channel Wesson too. Yup. The roller wheels gave it away. And a Spring or early Summer purchase. Brazed by Abdul El Saidi himself. Until I finally become Todd I will just have to fake it, and dispense made-up Brompton factoids. Anne should totally keep rocking that computer. And Tim will need a TT helmet too. she used it on the way home to leave me in her dust – it’s pretty exciting to watch your effort increase your speed! But it’s in a funky position – she said every time she looked down to check her speed (in the dark no less) she thought she was going to crash. Not good. Re the pin facing backwards, I think the concern is that really heavy, tall people can exert too much leverage at the seat-pillar/frame junction if the pin is rearward. You’re tall but not chubby. Careful? I found those tires sucky in wet corners and over pavement seams. The pebbling/bumps on the shoulders are the opposite of useful, minimizing contact when you need it most! Current Brompton tires decent, though I still prefer Marathons for enduring flat protection and Kojaks for extreme fun factor. Thanks Todd. I’ll be careful – I’m getting some pretty serious flex from the extendo post alone. I may wait a bit before adding the pin to the mix. Tim, I found a somewhat unconventional solution for my maximized seatpost extension on the Yuba Mundo. I cold welded (epoxied) a tube with a matching outer diameter to the seatpost’s inner diameter. Heavier? You betcha. But on the Mundo it’s not really an issue. I even lengthened the post 150mm, with a bit of a 2nd post added at the bottom. I got the cromo tubing through an online metal sales co. You can pick a variety of wall thicknesses, too, for varying levels of flex/stiffness. Sounds crude perhaps, but it is effective. I don’t know about the issues created by the pin option, but on a regular post your stress point is where the post meets the frame (maximum leverage point). This modification definitely takes care of that. Thanks Max. I’ll keep that in mind. I’m pretty sure the frame is beefy enough that I don’t have to worry about the stresses there. And I’ll have to admit the flexy post is kind of comfy. I’m hoping the nearly 35mm diameter will mean it’s not going buckle. But I have the stock post and if this one goes, I’ll modify the stock post into a telescoping jobbie and reinforce it like you recommend. Oh, if I feel really flush one day, there’s always Ti – all I have to do is source a really long 34.9 seat tube and use that as my seatpost. So many options for such a little bike. 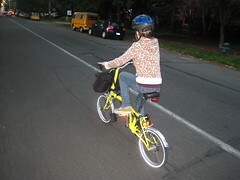 My excuse to buy a folding bike was b/c it was one size fits all so anyone who was visiting could ride it. My 7 year old has tried however the handle bars are too high! She does like to ride the sorte ( with a little help from me steering). She sits on the bar below the seat and can pedal. since it’s a trike it’s stable and she slowly rides it into the garage. I feel certain in a few years the very cool bikey 9 year old down the block would love to take it for a joy ride (he’s already shouted that he wants to ride it). If he asks nicely I’ll let him when he’s much older. That’s a really good point. I feel even better about our purchase now! Though I have to agree that one-size doesn’t mean EVERY size. We’re in the same boat: The Brommie _just_ fits our 9 y/o but our 7 y/o still has a ways to go.